There we go again, oh wait, we do not go anywhere: Shuttle Flight Scrubbed. Who thought that a McLaren Mercedes SLR was an expensive car, should have a look at these pictures we took today in the DÃ¼sseldorfer Medienhafen. 😉 20 million Euros in a very loooong car. Just found a new one: Mashmix.com. Nice archive over there. CNN has an article about Dabbeljuh and his iPod. If yes, then the MIT guys might have a solution for you: Clocky. 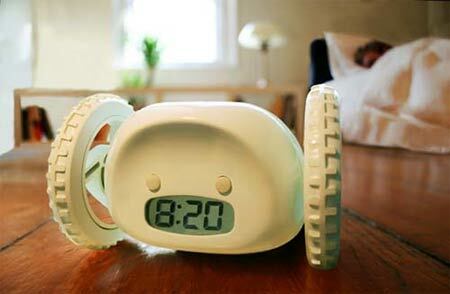 If you tend to hit the sleep button on your clock, this one will roll away and “hide” somewhere. Then, when it rings the next time, you first have to get out of bed and locate it before you can shut it off again. Yesterday I went to a good friend, and the first thing she mentioned was how happy I looked. Well, if she would have seen me last monday or tuesday it actually might have been true. But since then so many things crossed my way, that I cannot feel good at the moment. It all started with a weird wednesday morning. Then on thursday something foreseen happened, which I hoped would not happen that soon. Note: It’s totally unimportant how prepared you think you are for something – it will get you. Friday morning then was, different. I realized what happened on thursday and because of that I had the most haunting moment I ever had. But that evening things suddenly turned the other way. I’m still trying to make a sense of all that.